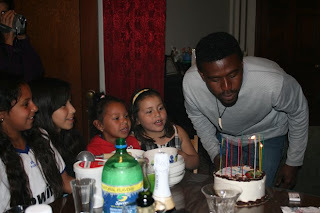 Andre enjoyed two birthday parties on April 23, with his ESL class and at home. Our friend Sunashi helps Andre display his birthday cake. Stephanie and Sage watch as Andre tries to blow out the sparkling candles. Two pairs of sisters anxiously await their piece of cake and ice cream. 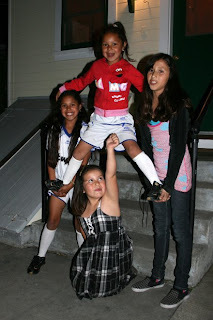 While the adults talked inside, the girls went outside to practice their cheers. Andre's doves take turns on the nest. Soon we should have two little baby doves. 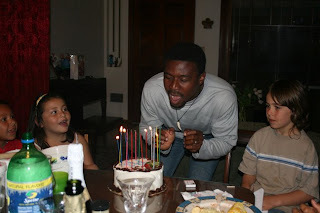 On April 23, 2009 Andre celebrated his 32nd birthday at school with his ESL class and at home with our friends. His teacher Peggy made her special birthday cake and I showed up at the end to take pictures of him with his classmates. 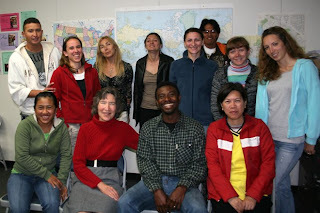 He's now in Level 5, which is the highest level at Santa Cruz Adult School, and will graduate in mid-June. 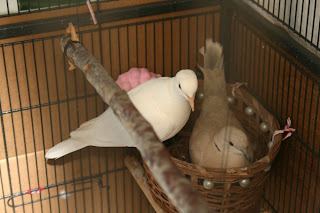 After class, I took Andre and his friend Orly from Ecuador to pick up his birthday present -- a pair of doves and a large cage -- without telling him where we were going or why. The woman who sold me the birds was just as excited as I was to see his reaction. This way he got to pick out his own pair -- a tan male and a white female. The seller delivered the cage in her truck and Andre got busy setting up their new home on our front porch. It's so nice to hear the doves cooing all the time. I knew Andre would love to have doves because he talks often about the ones he raised in Haiti. Starting out with one pair, after two years he had 27 doves. Then one night someone stole them all. I could tell that he really loved his doves and missed them. I'm really impressed by his knowledge of these birds and their habits and the good care he gives them. 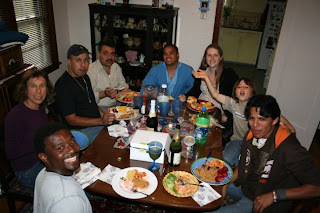 We invited Orly to come by for dinner that night. What Andre didn't know was I'd invited about a dozen other friends. I'd dropped off a big salmon with our friend Nancy so she could bake it at her house. Otherwise, Andre might have gotten suspicious. I just made the pasta and salad at home and bought a cake at my favorite bakery. It was a really great group of friends, representing several countries: Ecuador, Dominican Republic, Mexico, El Salvador, the U.S. and of course, our token Haitian. Spanish was the uniting language, and much of the conversation centered around our variations of Spanish and the food eaten in each country. The Oaxacans (from Southern Mexico) won the prize for the strangest food: fried grasshoppers. 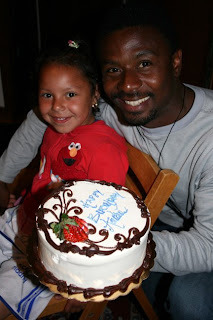 Last year I flew to Dominican Republic for Andre's 31st birthday because his fiance visa had been delayed. Two years ago, I was in California on his birthday, so I wired money to some friends so they could make a dinner and buy him a cake. But this was the first time we could be together in the U.S. on his birthday. I look forward to celebrating many more together.